Recently I read an article about a "Famous Wolf" which had been shot just outside of Yellowstone National Park in Wyoming. This wolf is apparently very well known and almost a celebrity to outdoor photographers and some wildlife enthusiasts. I do not want to be insensitive to those who make a living photographing Yellowstone's wildlife, yet I do wish to voice my own opinions about this situation. As the article states, "According to National Park Service estimates, there are more than 1,700 wolves living in the Rocky Mountain region—most in Idaho". There is no doubt that the wolf number in this area is not suffering tremendously as some may assume. According to another article I recently read, the state of Idaho is only roughly 100,000 elk. There is a lot of debate on how many elk are necessary to sustain a pack of wolves every year, and to be honest I do not think that there is one single correct answer to that question. However, I do know that the reason Idaho, Wyoming, Montana, and other states have began to allow wolves to be hunted is for wildlife management. The law of nature works by a supply and demand principle and when the the supply is lower than the demand, wolves will be looking for other ways to get their necessities for food. In the area I live in Idaho, I am fairly close to the border of Yellowstone National park. My whole life growing up hunting, I was always aware of the boarder to the park and the hunting restrictions in those areas. Yellowstone is not a zoo, and the animals are wild, thus they roam freely entering and exiting the park as they wish. I can't tell you how many times we have been close to the boarder of the park and the elk know where they are safe, and where they have pressure from hunters and/or hikers. These animals are quite intelligent and know when they are safe. Since this incident with the "famous wolf" being legally taken just outside of the park, Wyoming has now restricted hunting beyond the park boundaries to include a safe zone just outside of the park ON PUBLIC LAND. I do not feel that this will protect these animals any more than they already are, nor do I feel that this is right to restrict the hunters more than they already are concerning the size of the park compared to their hunting area. If the agencies in charge of managing the number of wild life in these areas feel that it is not only okay but also necessary to allow hunting of the wolves, I do not feel that there needs to be any more restrictions than those imposed by that management agency. The sad part about this situation is that if the hunter had taken any other wolf in this pack, there would not be as big of a push to restrict the wolf hunting in these areas. Just because this wolf is viewed as "famous" there is an issue. I do not expect everyone to see a problem with this like I do, but I do feel that I needed to at least voice my opinion on the matter. These wolves are multiplying quite rapidly and there are management strategies in place to keep them controlled and healthy. I don't know many people who would rather see a wolf starve to death over one taken legally by a hunter. If those outside of these areas wish to see wolves wander freely, I suggest a reintroduction of wolves in Central Park and other areas where wolves once roamed. Here is the other article mentioning how Montana has restricted hunting near the boarder of the park. My view in the morning as the sun comes up! The view from the bank looking at my fishing spot! My view looking from the lake toward the mountains! I know this was a short post, but I just felt like sharing a few pictures and stating ONE reason I enjoy ice fishing as much as I do... This is how I view heaven (maybe just a touch warmer)! With Christmas approaching, everyone is always looking for the best deals. This is especially true when it comes to hunting and fishing equipment! When I ask my friends or family what they want for Christmas I often hear things such as, "You can never have too much camo" or "Just get me something for hunting or fishing and I'll be happy". This is great for me when it comes to holiday shopping because I can usually get it all done in one spot. The only problem I run into is not being able to fit all of these outdoorsy gifts into my budget! Luckily, there is a place I can go to get these gifts at a HUGE discount! 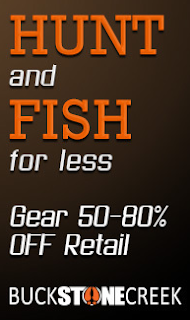 Buck Stone Creek is a private website which offers amazing deals on the gear you normally use! On this site, you can find brands such as SOG Knives, Gorilla Tree Stand Gear, Brunton, Toad-A-Flage Camo, Muzzy, Vanguard, Scent-Lock, Tool Logic, and more! The best part about the site is that these brands are usually offered at an amazing discounted price such as 50-80% off! This is awesome for a guy like me who has a huge love for the outdoors as well as sharing this passion with all my friends and family. This means that my pay check can go further when getting the necessary equipment I need to maintain my passion. This site is one of a kind and is definitely worth checking out. The way the site operates is that you have to register in order to see the deals they offer. This is the only way they are able to offer such unreal deals on the equipment you normally buy for double the price. They offer a few products at a time in a "flash sale" style which allows them to coordinate these sales with their retail providers and to ensure the customer that they are offering the best deal possible. These sales are only available for a limited time so it is important that you keep up on their sales to make sure you don't miss out. Because the guys over at Buck Stone Creek are wanting to make sure they are offering the best deals available, they have agreed to give an additional 10% off your first purchase on already discounted items for all those who click the Buck Stone Creek icon on the side of my blog and use the promo code "idahopursuit" in the promo code box when completing their checkout! So, the bottom line is that if you are going to buy gear for the outdoors, why wouldn't you do so at half the price? It seems a little odd to go out and attempt to "out smart" an animal while hunting if we aren't smart enough to survive in the world we live in. Why make our passion any harder to live by spending double the price for the gear you could get from our friends at Buck Stone Creek for a discounted price? I don't think I'm the only one who feels this way, so please click their link on the side of my blog, get registered, and be sure to use "idahopursuit" in the promo code box to get an additional 10% of your first purchase on amazingly discounted hunting/fishing gear! When I go fishing, I often have the perspective that I am there for the quality instead of quantity.... In other words, I would rather catch one big fish than fifty tiny fish. I feel that catching "the big one" or a fish that is unique in some way is much more worth it than catching numerous small fish. Don't get me wrong, this is not to say that I do not enjoy getting out and catching fish of all shapes and sizes, I am just stating what goes on in my head (usually while I'm sitting there watching everyone around me catch fish and me doing nothing but sitting there thinking...) I would much rather catch a few small fish than no fish at all! I have fished enough in my area to know what works in the different bodies of water I fish in. I am sure there are things that work that I am not aware of, but I have my own "traditions" you might say that I use religiously for bait. I have caught quite a few big fish of many different species and feel that I will have to get pretty lucky if I am going to out do my own records on some species. Here in Idaho, I am able to ice fish with up to 5 poles at a time which allows me to use what I know works, as well as take the time to try something new to see if it works any better. Recently, I have been visiting with the Matt who designed the JawJacker and one tip he suggested, is to use a smaller bait to get more hook ups. I will admit, I thought to myself that I may be able to catch more fish if I go to a smaller bait, but I will not catch as many big fish by doing this. I went fishing a few times this year, and what I have always used seemed to be working just fine so I didn't think twice about changing things up. A trout I caught earlier this year. 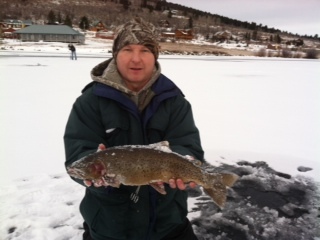 This last Saturday however, I was ice fishing and wasn't having as good as luck as I had been hoping for. It had been about an hour and I had only caught a few small fish. By this point I thought, I might as well try using smaller bait to see what happens. I decided to use a few jigs Matt had told me to use, and tipped them with half of meal worm. I was quite skeptical putting such a small jig and bait down the hole while my other poles were baited up with much larger baits. I set it all up in my JawJacker with the bait a few feet off the bottom and walked away. By the time I got to my seat and sat down my JawJacker went off! My first thought was that I had failed to set it up right and the JawJacker had gone off due to some mistake on my part, but when I looked at the pole I could see that the only mistake was that I hadn't listened to this advice sooner! My pole tip was bending with the fight of a decent sized Cut Throat Trout who thought my bait was just to much to resist! I pulled in the fish and in this picture you can see the jig I caught it with. Cut Throat Trout caught on "Fire Fly Slush Bug"
After this experience, I will admit, I ended up changing 3 of my 5 poles to have similar bait. I started catching quite a few fish and ended the day by pulling 24 onto the ice. I did catch a few on the bait that have always had good luck with, but I was surprised at how many decent size trout I caught on such small bait. So next time you are sitting there on the ice not catching anything, maybe try switching your bait around and maybe even downsizing your bait to see if that helps. This may be a tip that many people already know or talk about, but it was new to me and thought I would pass it on to anyone who may be interested. The winner of the JawJacker giveaway is Karen Philips a follower from Facebook. She is an Idaho resident who has been begging her husband to take her ice fishing and it look like now he will be begging her to come so he can use her new gear! Congrats Karen, I hope you and your husband enjoy ice fishing this year. Let us know how you do! 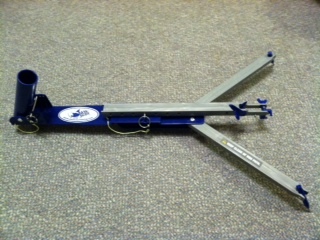 Many of you may not know what this contraption is, but hopefully after reading this it will be on your wish list! 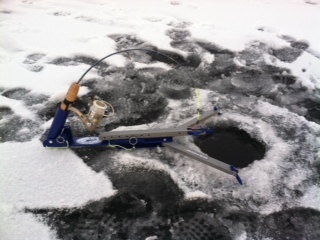 What you see above is called a JawJacker which is an ice fishing contraption with the purpose of making good ice fisherman great! The way it works is explained and demonstrated thoroughly on this video from YouTube. When I used these for the first time myself, it shocked me how easy they were to use! I will admit, I was worried looking at it and wondering if I would set it up wrong with all the different adjustments such as the rod height, the trigger slide, and the trigger tension. After getting it out of the box and playing around with it, I realized that all of these adjustments are extremely simple and self explanatory. If there is any confusion on how to set it up, there are step by step instructions on the back of the JawJacker box. I headed up to the lake Friday morning to give these a shot in hopes that I would have some good luck. JawJacker set up and ready for a bite! In Idaho, we are able to use 5 poles which can be hard to monitor all 5 poles at once. With my poles in the JawJacker, I didn't stress about looking around constantly checking to see if my poles were getting a bite or not. This made ice fishing so much more relaxing and enjoyable because I was able to sit and jig one pole while all my other poles were being "monitored" by the JawJacker. It wasn't long until I got some action on the JawJacker and the only words I have to say about my first experience is that these things work! I was able to catch some great fish using these things and had a blast every time one went off. I would be in the middle of a conversation and then hear the sound of a JawJacker go off and my adrenaline would rush in anticipation of what would come next. There were a few times when the JawJacker would go off, but fail to hook my fish... I was a little frustrated and thought that there was just a little fish messing with my bait. Then I remembered a tip which was also on the back of the JawJacker box which said that if you are getting bites on the JawJacker but not having many hookups, then try to downsize your bait. I thought what do I have to loose, so I gave it a shot... Sure enough the next time the JawJacker went off the fish was hooked and the rest was left up to me to get that fish on the ice. My dad and I spent about 6 hours on the ice and caught almost 50 fish. There were quite a few people fishing around us who kept saying that the fishing was quite slow. In respect to them, the fishing was quite a bit slower than what it had been for them a few days earlier. They were catching a few fish here and there, but the fish were not biting very hard for some reason this day. Those next to us would run from pole to pole because they would see a fish was nibbling on their bait, but by the time they got to it the fish was either gone or it was not interested in their bait any more. I would not say that we had more bites than the other fisherman around us, but the difference was that when we were getting bites, we were mostly always hooking up with a fish because of the JawJacker. A few of these people kept asking us what we were using for bait and we were open and honest about what we were using. To their disappointment, it was the same thing they were using, but we were catching more fish. I would definitely say that the purpose of the JawJacker, which is to "make good ice fisherman great," was fulfilled because the only difference between us and the other guys was the JawJackers... AND... about 30 more fish! When we decided to call it a day and pack up, the JawJackers collapsed very compact and simple so that they were easy to pack on and off the ice. They are also secure so that you don't have to worry about any part of the JawJacker getting caught on something and breaking off. My personal favorite part about the JawJacker is that you are more likely to catch more fish with them than you are without them. In my opinion, the more fish you catch, the better chance you have of catching a big fish! The great part about this day is that my thoughts were confirmed because the last fish we pulled in for the day was this great trout! My Catch of the Day! I would 100% recommend the JawJacker to anyone who enjoys ice fishing, or is thinking about getting started in ice fishing. You do not have to be a professional to run one of these contraptions, and they are worth every penny. Honestly if you see one of these things work you will realize that they are worth it! This is why Matt from JawJacker Ice Fishing Supplies is letting me give one of these away on my blog to show some lucky reader/follower how amazing this product really is! All you have to do to be registered to win is share this blog post either on Facebook or Twitter AND leave a comment below! The drawing will be Wednesday November 28th so please pass this word on and leave a comment for your chance to win a free JawJacker!!! Visit his website for tips on ice fishing and other ice fishing gear! Great way to start the morning! It is getting to be that time of year again!!! I love winters in Idaho! I know a lot of people complain about the cold and the snow, but I absolutely love the winter because it means one thing... ICE FISHING!!! I have grown up ice fishing, but the last two years, I have really taken it a lot more serious. I used to go out with one, maybe two poles and sit there frozen next to a hole in hopes of catching a fish or two. In Idaho, you are able to fish with 5 poles as long as you can maintain all 5 of them. My dad purchased a gas powered auger so that we wouldn't have to hand drill all of our holes, and my wife (yes it was her idea) informed me that if she was going to continue ice fishing with me then I would have to buy a ice shelter. Between the auger, the shelter, and all of the other gear, I was destined to make it worth the investment. My wife and I started to go as often as we could and began to have a lot of fun! Eventually, I was able to talk a few of my family and friends into coming out and going fishing with us. I realize that the idea of going outside while it is literally below freezing (often times below 0) standing on a frozen lake over top of a small little hole waiting and hoping for a fish to bite doesn't sound like a lot of fun to people. 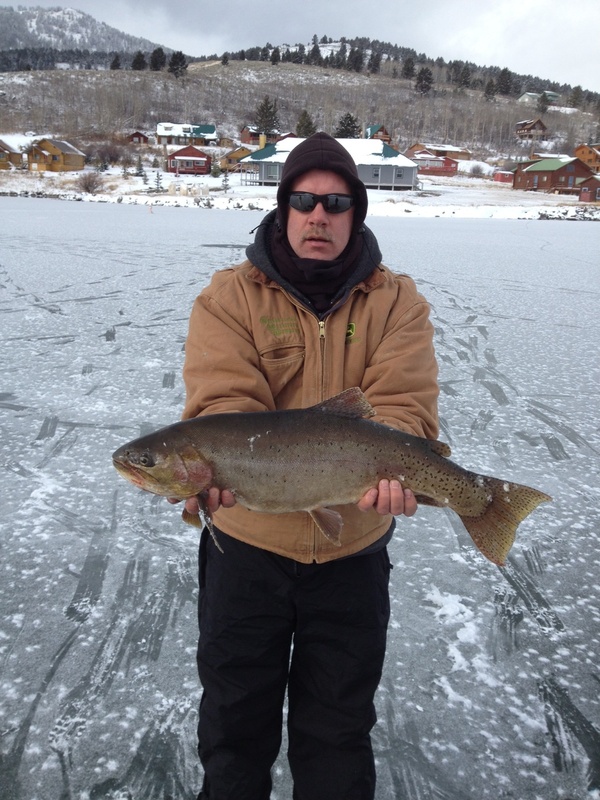 I have however, been quite surprised at how many people have really enjoyed ice fishing once they get out and do it. It really helps having the ice shelter and a little heater to stay warm, but even without it most of the people we took has a blast. While reminissing on last years season, I can't help but get excited to get out there again soon and hit the ice! I have a few new things I have been wanting to try out and hope to out do my best ice fishing catch of last year which was a 7 1/2 pound trout. 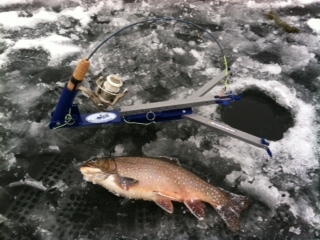 My uncle had to torture me today on his day off by being one of the first ones to hit the ice this year and witness this 9 1/2 pound trout being pulled through the ice! If all goes my way I will be out there Friday trying my luck! 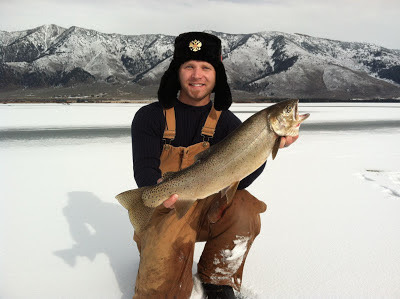 If you want to read more about our ice fishing from previous years you can check out my brother's post on his blog ! That's a small buck... ya but it tastes great!!! Today was the end of rifle season for deer here in Idaho. On my last post, I wrote about how my wife and I were able to share the experience of both of us filling our tags on the same day. I love the memory and am glad that my wife and I could put some meat in the freezer. After filling my buck tag with the small two point I shot, I was left to fill by doe tag. As I mentioned today was the last day of rifle season and I hadn't even gone out once to look for deer. I figured I would just go later in the season to look for a doe so that I could watch for any bucks during the rut during late archery season. My dad called me yesterday and said that he wanted to go out on a drive to see if the recent snow storm had gotten the deer moving. Of course with all my work piling up from my job and masters program, it was a no brainer... I had to go hunting! So my dad picked me up in his truck and we took off toward the mountains. We sought out with the thoughts that if we even got a pine grouse we would be happy and the trip would be worth it... Before we even hit the tree line we saw a grouse on the road so we pulled out the shot gun and provided ourselves with a snack. We proceeded to drive around and hunt in a few areas, mostly glassing mountain sides and frequently used areas hoping to see some animals moving around in the bad weather. With the snow and the temperature down to 30 degrees we couldn't help but talk about winter coming. We talked about everything we had to do before the holidays and we also talked about how excited we were for ice fishing. During this conversation, my dad said something along the lines of how he hates the dilemma of choosing between hunting and fishing late in the season because he enjoys them both quite a bit. I made the joke and said that is why I shot the first buck I saw because I just wanted meat in the freezer and more time for ice fishing... Give it, I love to chase deer late in the season, and my statement wasn't 100% truthful, but at the same time it wasn't a false statement either. My dad talked about how he had eaten tag soup the last few years because he was "holding out" for a bigger buck. This is a man who has shot more big bucks than anyone I know... We talked about how with everything we had going on that he might shoot his white tail doe if he saw one, or maybe even a smaller buck if he got the opportunity. We decided at this point that we would drive out on a different road and try to get near some fields to see if we could catch some deer coming out right when the sun was going down. We didn't even drive 100 feet before we saw a small two point cross the road in-front of us! My dad and I both jumped out of the vehicle with our guns and looked around to see if there were any more deer in the area. The only deer we saw was the two point who had gone about 40 yards and stopped broadside staring at us. My dad looked at me and asked what I thought and I told him it was up to him. 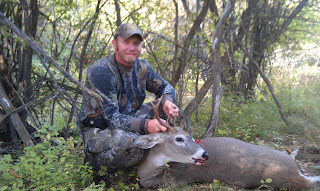 Next thing I knew my dad had pulled the trigger and this buck was down. My dad was super excited that he shot a deer and that it was so close to the road. 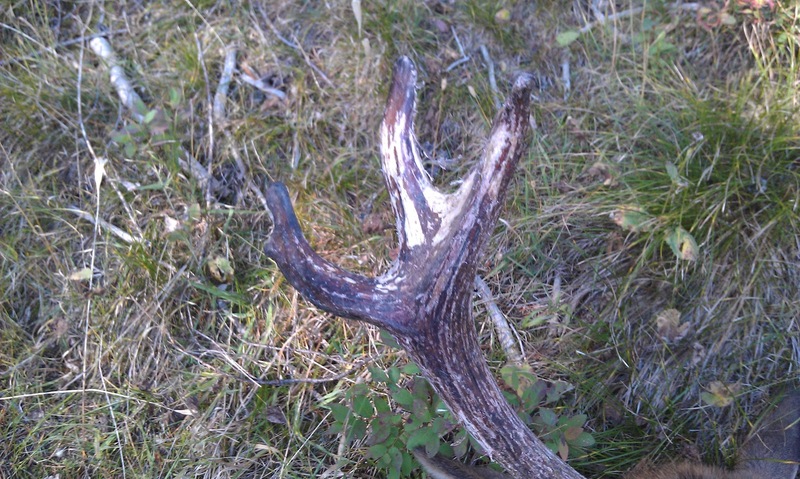 We each grabbed a horn and drug it back to the truck. After taking care of the deer my dad and I talked about how we had talked about filling out tag so that we could fill our freezers. We talked about how long it had been since he and I had drove around as father and son and shared the experience of taking an animal together. We talked about our families and our lives and how blessed we are to be doing what we are doing. I was taught that the reason we hunt is to help provide for our families. We enjoy the sport and enjoy the comradery, and we don't feel guilty hunting or shooting any animal because we know it does not go to waste. I often hear people express feelings about deer management and what a "shooter" buck is or is not... I share the story of my wife, my dad, and myself not to rub it in anyone's face that I disagree, but more as a conversation starter wondering what peoples thoughts are about these three experiences and our decision to take the deer we did. I am not mad when people do not agree with me, but I am interested in their thoughts. These deer have all been cut up and packaged personally by my family and we enjoy eating the venison as often as we can. As I have mentioned, the only thing I enjoy more than spending time outdoors is spending time with my family. I absolutely love my wife and three month old daughter. As passionate as I am about the outdoors, my wife knows my whole heart is with her and my daughter. So this last Thursday, my goal was to take my wife hunting while she was on a two week break from work. My wife has turned out to be quite the outdoors woman, she has out done me every hunting season we have been together. My one goal with this hunt was to get our baby dropped off with the baby sitter and get my wife and I in our stands by first light... (Anyone who has had a three month old may have just laughed when you read that...) Needless to say, we were cutting it pretty close due to dirty diapers and loading up all the baby and hunting gear. 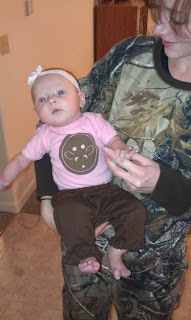 Just for good luck, we dressed my daughter in her favorite Button Buck outfit. My wife and I both knew that we had to hurry to our stands once we arrived to our hunting area. My wife, being a school teacher and new mom, was determined that today was the day she was going to get a deer because she really didn't have time to come out much more if she didn't get one... We talked on the hike into our stands about whether or not she would shoot a doe or wait to see if a buck came under her stand. We determined that she had never shot a buck with her bow so she would love to shoot a buck, but if a good healthy doe was standing under her stand then she would get it. I, being the gentleman that I am, walked my wife to her stand and waited until she was up in the tree and all set before I walked to mine. It took me about 20 minutes for me to get into my stand because I was going super slow and trying to be as quiet as possible because it was slowly becoming light enough to see. As soon as I got into my stand and all set up I checked my phone and I had a text message from my wife which said that there was a small buck in the clearing by her stand but that it had gone back into the trees. I told her to stay still and that if she was lucky he would come back out... Sure enough, my wife has all the luck because shortly after I sent this text I got a phone call from my wife telling me that she shot a little two point white tail! She was super excited and I could hear in her voice how happy she was that she had taken her first buck with her bow. My wife told me that she wasn't super sure about the shot placement, but knew that she hit him pretty good. She told me, if for some reason he comes toward you, get another arrow in him to slow him down. I can't tell you how proud I am/was of my wife. I was sitting in my stand all smiles about how my wife had just got a small two point buck when I looked up and saw a little two point walking through the trees. It stopped in a little opening just wide enough that I could see it had exactly the same size/description of horns my wife was talking about. I thought to myself, "man if that buck gets away injured my wife is going to feel horrible". I decided that I would try to squeeze an arrow through the trees and at least slow it down so that my wife could finish it off. I pulled back and waited for a decent shot. 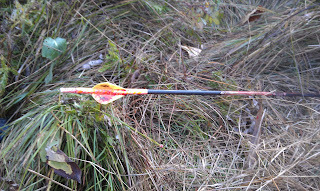 The deer took one step forward and gave me a chance to let my arrow fly. Sure enough the arrow hit the deer behind the shoulder but a little higher than I had wanted. I watched it run off about 15 yards and fall over kicking! My shot had gotten it right in the lungs and done its job. 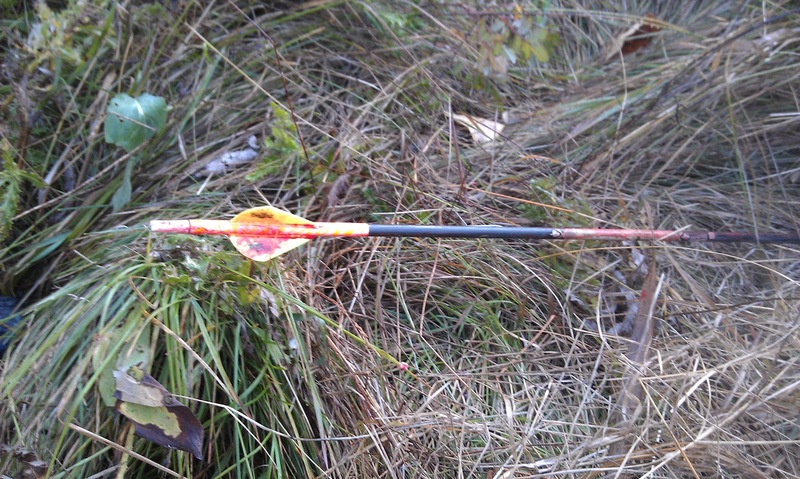 Yup, my arrow is covered with blood! I kinda chuckled and told her that we may have shot two different deer. I went over to her stand and helped her track her deer. 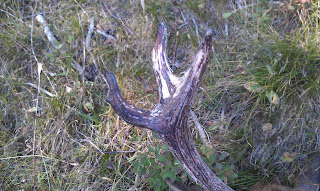 My wife took the lead and followed the blood trail until we got near a slough the deer often cross. I told her that we would have to walk around to a fallen tree in order to cross and pick up the blood trail on the other side. She sat there for a while and pointed out that her deer didn't make it across the slough, but had died right in the middle of it! My wife was super excited to see that she had made a good shot on her deer and that she had taken her first buck with her bow! So we both ended up filling out buck tags for the year in one day. I had a few mixed feelings about taking a small two point buck, but even though this may be one of smallest bucks I've ever taken it was by far one of the best! 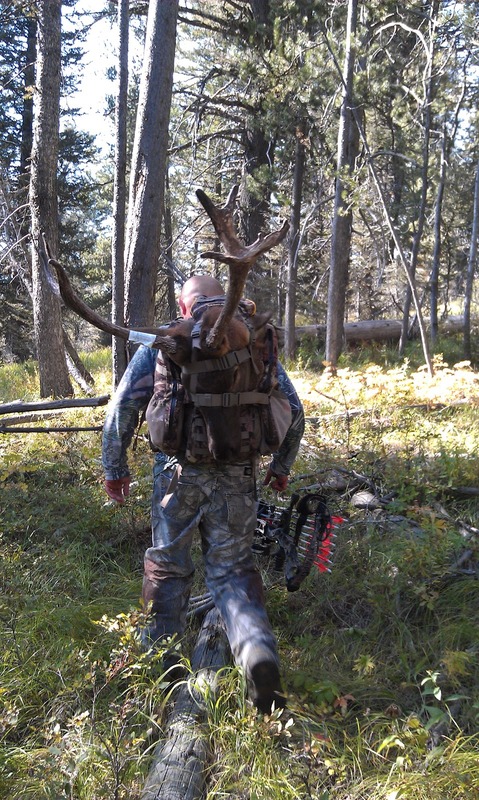 It reiterated the point to me that a trophy does not have to be a wall hanger or some majestic animal, but more of the story behind the picture and who you share it with. This was one of my proudest days as a hunter knowing that my wife and I had put in the time and effort through the off season to get our stands and ourselves ready for this hunt and both tag out on the same day! It wouldn't have mattered if it was a little two point, a doe, or some great big monster buck, I enjoyed every second of this hunt because I was with my wife every step of the way! Great day, and great memories! 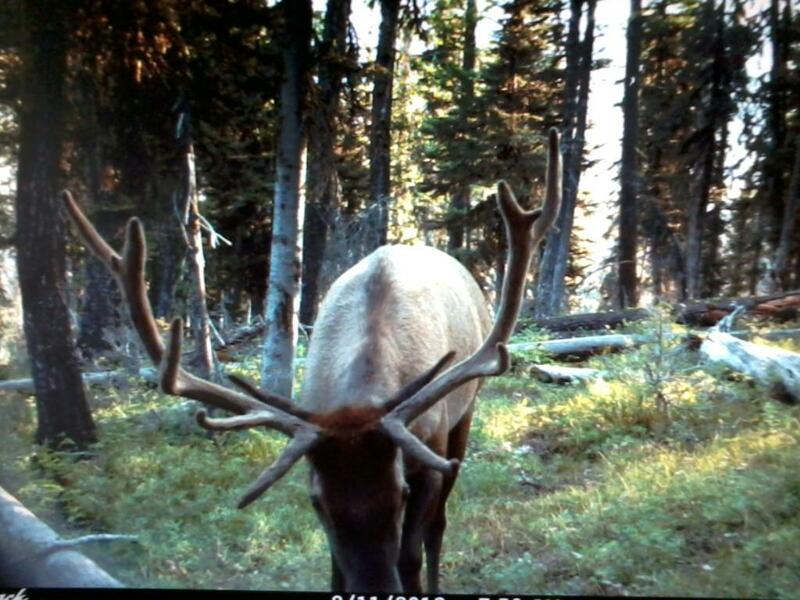 Bull Elk I was going after! So my brother Dustin got involved with Twitter recently and made friends with Rudy over at Huntography. Rudy decided that this hunting season he would capitalize on his Deer Tour and create a film featuring elk hunting and call it Elk Tour! Well with my brother and him talking on Twitter, the next thing we know is that Rudy was planning on coming to South Eastern Idaho to go elk hunting. Our hunt was full of some good action right from the get go. 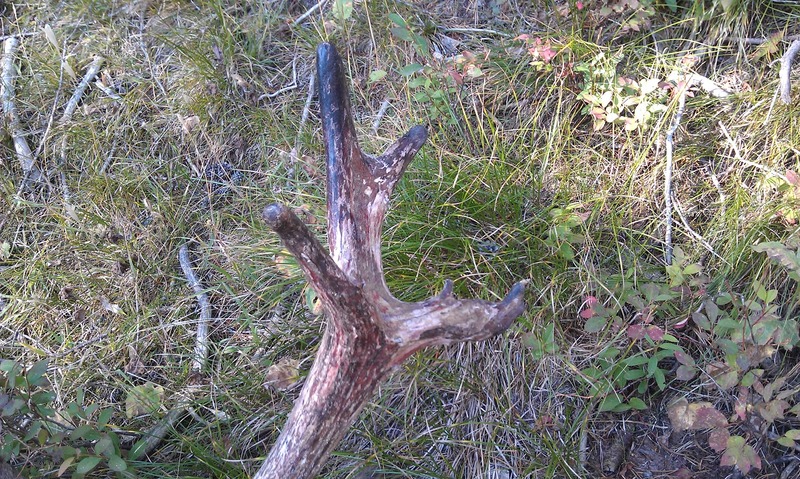 We got to the spot we planned to get to and shortly after we made a few cow calls we heard a bull bugle back at us. From that point on we chased elk for the next few days. 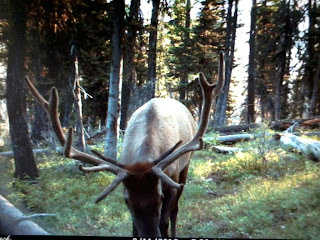 At times we would spot and stalk when other times we would sit by ponds and trails the elk frequented. I myself had to drive back and forth every day because I am a football coach at our local high school. I hunted in the mornings and afternoons, but then drove back in time for football practice. One evening when I was coaching football my dad told me that he had shot a "spike" right before it got to dark, but said that he did not track it any further than the first sign of blood. He told me that he wasn't super sure he had made a good shot, and did not want to push the elk if his shot wasn't as good as he had hoped. We decided that the next morning Dustin and Rudy would take off after the elk they had encountered the day before while my dad and I tracked down his elk. That morning he and I went to the first sign of blood and started tracking. While tracking I kept looking around in hopes of spotting another elk or maybe even the elk my dad had shot if it wasn't dead already. After tracking it for about 50 yards, I spotted a cat like creature jump up onto a fallen log. I was a bit confused about what this animal was until it walked out into a clearing and this is what I saw. 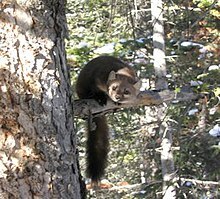 After spotting the pine martin, I kept scanning the are for sign of elk and realized that the martin was probably munching on my dad's elk because it was laying about 10 yards away from where the martin had ran from! My dad and I were super excited to recover his elk, and glad to know that his shot was perfectly placed. 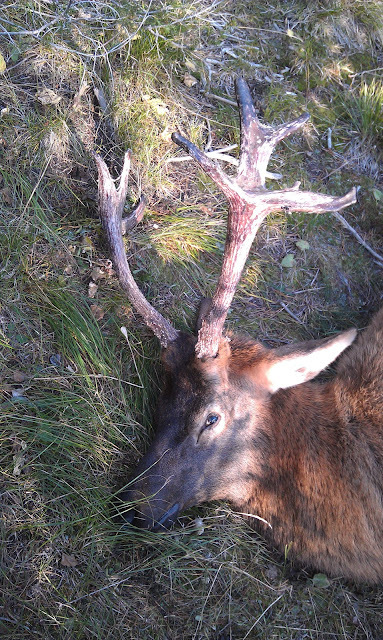 The elk didn't travel more than 70 yards from where it was hit before it died. 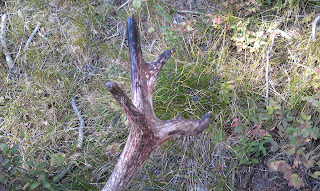 My dad had thought that the elk he shot was a spike which had a few random points coming off one side, but when we walked up to it, this is what we found! This elk was one of the most unique elk that I've ever seen. It would have been interesting to see if his antler growth would have been this crazy when he got a bit older, but with us being meat hunters we are more happy to get our freezer full for the winter. 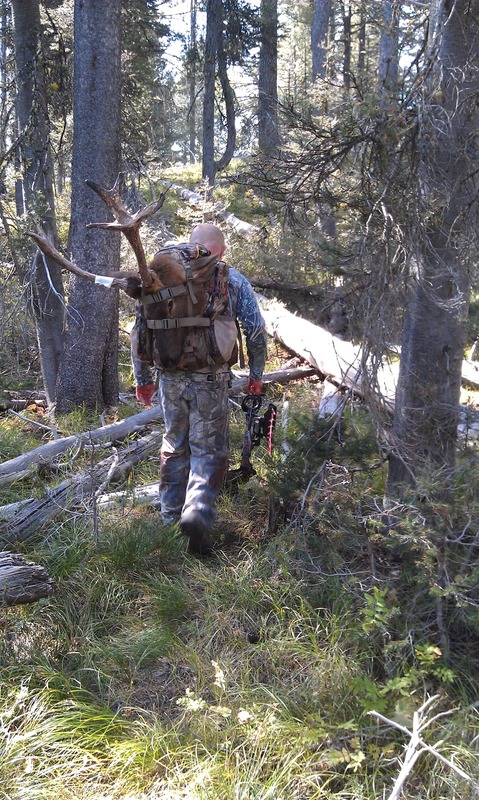 After we sat in awe for a while then all the work began to clean the elk and pack it out... This made for one good hunting trip and definitely one I will remember with the elk which looked like it could be a cross between an elk and red stag. Now I just need to get back out there and find his daddy or grandpa to fill my tag!!! Hunting in Idaho brings an array of adventures. As it is for all of you in other parts of the world, it is important for me to know what type dangers I way/will be facing when hunting in certain areas. Idaho has been part of a huge wild life management project involving the reintroduction of wolves and grizzly bears. 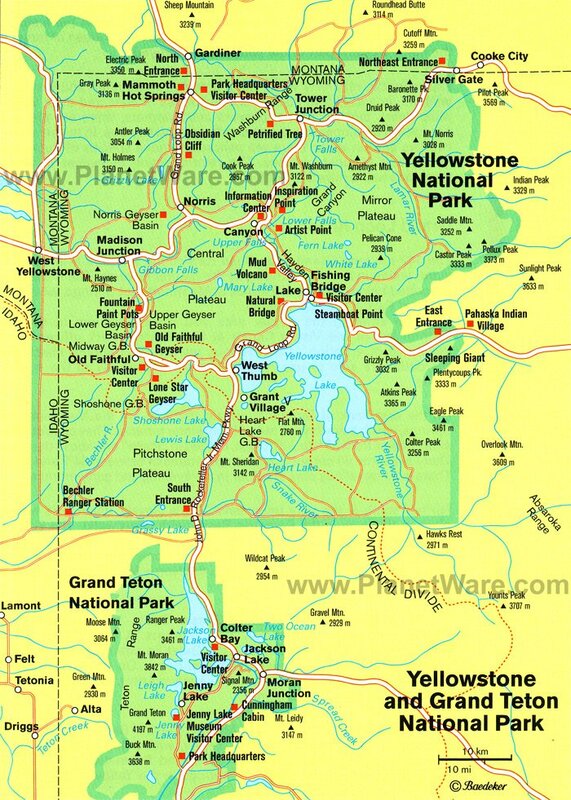 In the South Eastern border of Idaho, we are only a few miles away from Yellowstone National Park. This means that there are larger numbers of wolves and grizzly bears roaming around in our area due to the protection they receive in the area. 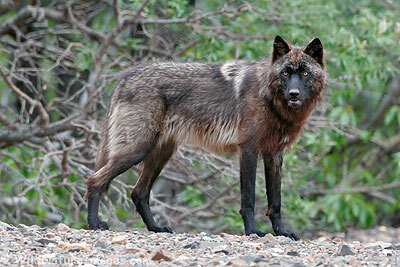 For a interesting read check out this article from the Yellowstone National Park about wolf management. The article briefly talks about how the numbers of wolves have stayed relatively the same or even declined in the park due to smaller elk populations. I know I am not a genus, but I can put two and two together and tell you 1) Wolves eat Elk, 2) Elk will either leave the park or get eaten, and 3) Wolves will follow the leaving elk. Yellowstone does not have a high fence around it like a zoo keeping the animals in for tourists to see. These animals are wild... even though many were placed there, they don't always stay in the park. Not to go on and on about the park or the management of wolves and grizzly bear, but I wanted to set a basis for my next few points. 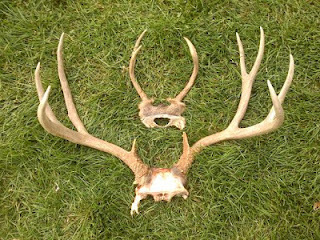 Recently I have been scouting and hunting for elk up in the South Eastern side of Idaho. All summer long we got pictures of elk, and then the week before hunting season we got a pictures of a wolf on camera. Even though we know there are wolves in this area, we had some mixed feelings about seeing the wolf. We were both excited because we can hunt wolves now in Idaho, but also unsettles because we know the elk and deer would be on edge with wolves being in the area. We were also a little unsettled knowing that we may become the hunted when sneaking through the woods cow calling for elk. 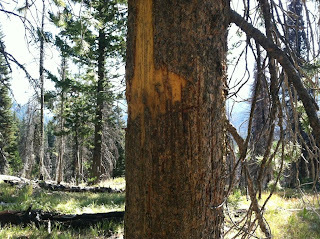 On Saturday I had the opportunity to hunt the area where we had gotten the picture of the wolf. I sat all day and then I saw two deer heading my way. Just when they got about 40 yards away they both stopped and stared down hill for a long time. Their ears were pointing forward and nostrils flared wide open. They stood there for a while until they turned and hopped back over the hill they had come from. I was a bit confused because the wind was in my face and I had taken lots of precaution for scent control... About 10 minutes later, I saw something move through the trees to my left. I slowly turned to look and reached for my bow, I saw glimpses of some darker colored animal moving through the grass then stop behind some fallen trees almost in the same spot the deer had stopped moments before. A few seconds later it walked out from behind the fallen tree and I was staring eye to eye with a wolf. I was never able to get a shot on him, nor did I have my camera (last thing on my mind) but seeing it was pretty exciting. This is a pictures of a wolf I found online that looks similar to the wolf I saw. This wolf was all by itself and was looking pretty dang hungry. I thought my heart got going when a deer or elk come into my stand... I don't which makes me more nervous to have in my hunting area, a pack of wolves or one extremely hungry wolf. An average wolf is about 5 feet long and around 150 pounds (give or take some depending on its age), but either way I would have felt more safe having an arrow in this guy instead of watching him disappear into the trees. When I got back to the truck later I told my dad about the encounter I had, he showed me this pictures of a grizzly rub next to our other tree stand. These two signs have made me and my family take a little more precaution when preparing for hunting. We always pack bear spray, a pistol for safety, and try to always hunt in pairs whenever possible. We know that wild animals are often more scared of us then we are of them, but when possibly facing a predator close to 800 pounds with razor sharp claws you always have a need to worry. I guess this just adds to the excitement. The Idaho Fish and Game have provided some good information on how to hunt in grizzly country if any of you are planning on coming up this way. 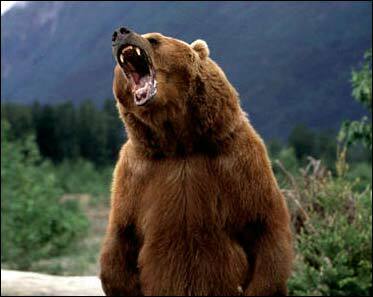 It may be worth the time to read it, playing dead with a grizzly doesn't always work out in the end! I often hear guys talking to me about their wife and how she absolutely hates how much they hunt. I just smile and tell them I feel sorry for them, but that it is almost as hard when you're wife shoots a bigger buck than you! I am extremely lucky to have a wife who hunts with me and shares my passion for the outdoors. A lot of my friends always ask me how I got so lucky to marry a girl who loves to hunt and fish. My response to them is that I didn't. When I met my wife, hunting was probably one of the last things on her to do list! I share with my friends my wife's story and always tell them its worth a shot for them to try with their wife. For me, being outdoors has always been part of my every day life. Growing up my family spent much of our time outdoors either camping, boating, fishing, hunting, hiking, or anything else we could find to do. When I was single I often dated "city" girls and "country" girls and thought I had it made up in my mind that there was no way I could ever marry some "city slicker" who wouldn't share my appreciate for the outdoors. Just my luck, I ended up meeting a beautiful, patient, understanding, city slicker who I fell head over heals for who is now my wife! For my wedding gift from my father, my wife and I received brand new compound bows! For me I was ecstatic but for my wife she was questioning what in the world she had gotten herself into. Growing up she had been around guns a few times, but her and her family were just not involved in the same types of things I had grown up with. When my wife got the bow she told me that she would shoot it with me as a hobby, but she had no intentions of hunting or killing anything with it. This was the route my wife took until she started shooting more often... Quickly she realized that she was actually pretty good at shooting a bow. I took her to a few 3D archery shoots where she was able to show off her skills and even show me up every once and a while. After feeling the excitement and confidence in learning how to shoot her bow, my wife decided she would come and sit in a tree stand with me while I hunted. I had set up two treestands right next to each other earlier in the year because I was wanting her to come with me at times. My wife sat with me one particular evening and watched a few deer come into our stand. Sharing this experience with someone who has never sat in a tree for hours until the animals around them start walking around is an experience hard to capture the feelings behind. Needless to say, my wife had felt the fire and had a desire to get her hunting license. Since then she has taken a bull elk, mule deer buck, and a bow kill white tail doe! She loves to hunt and I consider myself a lucky man! I always tell my friends that getting their wife into the outdoors (and not always killing something) can be some of the greatest times you have as a couple. And who knows, maybe they will feel the desire to go with you just to show you up :) Always remember though, if someone is forced into anything they do not want to do, most of the time all that does is push them further away than they were before. So when sharing the outdoors with those you love make sure it is what they want to do so that you can help them have a good time! 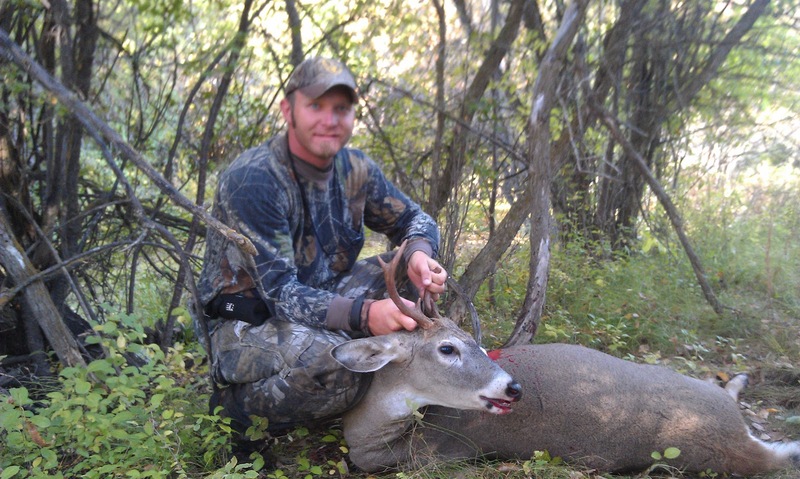 For me in South Eastern Idaho, archery season for deer and elk starts this Thursday! I'm like a little kid on the night before Christmas every year when hunting season comes around. My wife thinks I'm obsessed, my boss thinks I'm crazy, and I think I'm glad neither one of them can read my thoughts to know exactly how much I think about hunting. I work with individuals who have mental disorders and I know I shouldn't be so obsessed about hunting but I am and that's the way I'm staying. On that note, I've taken some time to contemplate the oddness of my obsession (some of you may be able to relate), and I've concluded that my boss may be correct about thinking I am a bit crazy. I have heard of other hunters swearing by a lucky hat, or lucky hunting shirt that they have to wear no matter how old or worn out it is. I personally know a guy who stops shaving the week of opening day and will not shave until he shoots something (right now he is sporting a year long beard). It must be true, we hunters are crazy... We carry around rabbit's feet, buckeyes, lucky coins, and other random idols believing they really make a difference... Or do they? Every opening day I have my own tradition to lay out all my hunting clothes the night before on my living room floor, making a silhouette of what I will look like in the morning. Then opening morning, I grab me mountain dew and some raspberry filled powder doughnuts for breakfast. 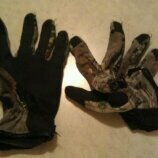 When I get to where I park my jeep I HAVE to put on my lucky hunting gloves, no matter what the temperature is! If I do not follow this routine on opening day, I might as well stay home because I can almost guaranty you that I won't have any luck. Call it superstition, buck fever, or even call it crazy, all I know is that I will do anything to up my odds of filling my tag. As I have mentioned I know I'm not the only one with hunting traditional or superstitions so please leave a comment letting me know what some of you do. Maybe then I can show my wife that I'm not the only one! When hunting in South Eastern Idaho I have to be prepared to hunt in an array of different terrains. One day last year I chased elk high in the mountains, came home and pushed the river bottoms for white tail deer, then ran out to the desert to try and find mule deer. Not only did I experience many different types of country, but I also walked A LOT that day. Days like that aren't unusual for me during the hunting season so one thing I make sure of is that I have a pair of boots that will be reliable and comfortable no matter where I go or how long I'll be there. I have tried a few different brands and have not been satisfied with any of them until I tried Danner Boots. Danner is a company that has been around for a long time, and the quality of their boots explain why. The pair that I currently use is the Danner Elk Ridge GTX 8 inch un-insulated hunting boot. These boots have a gortex lining which make it waterproof and wonderful to wear around in any weather. When I wear these boots antelope hunting out on the desert my feet don't get to hot, and I have even worn these boots snowshoeing in the middle of january and my feet stayed nice and warm (with insulated socks on). The Elk Ridge™ GTX® boot has a classic stitchdown design for rugged durability and stability underfoot. Spawned by the immensely popular Frontier™, the Elk Ridge is an extreme hunting boot for early to late season hunters designed for comfort and protection in the most treacherous terrains and conditions. Full-grain leather and tough, tear-resistant 1000 Denier nylon upper for durability. A deep padded collar and Fatigue Fighter™ insole provide all-day comfort. Comfort - When it comes to boots the most important thing to me is comfort. I've said it before but I'll say it again, I'd wear these boots to bed if my wife would let me. These boots have always been extremely comfortable even on the first day out of the box. Danner knows that an uncomfortable boot an limit you severely on any adventure. I myself have owned 3 different pairs of Danner boots and the comfort level has been the same with all of them. I have no idea what Danner means by "Deeply padded Fatigue Fighter™ footbed for all-day comfort and support", but my feet sure appreciate it! These boots are full of padding which give cushion and support where needed. I have walked close to 20 miles in one day in these boots and still had comfortable (yet tired) feet. Durability - These boots have been through a lot. As much as I've worn these boots I would have susspected that the Gore-Tex lining would have worn out and my feel would get we, but the only time my feet get wet is when I go over my boot. These boots weigh in at 64 oz which is great considering how much durability, traction, and padding you have for comfort. These boots have been wet so many times it amazes me that the stitching, and the leather have not worn out by now. I have learned by now that this is just the quality that Danner puts into their boots because they care about what they do. I found this video which shows you the type of quality that goes into a Danner boot. I know a lot of people have their own opinions about what the best boot is and I respect their opinions, but I encourage anyone who is thinking about a pair of boots to look into the Danner Elk Ridge boots because they will exceed your expectations. I have heard some people, including my own family, say that the reason they do not wear Danner boots is because of the price, but then I also see how many pair of boots they go through while I still wear my one pair of Danner's. It would be worth it no matter where you live or where you hunt to check out a pair of Danner's and find out for yourself how awesome these boots are! 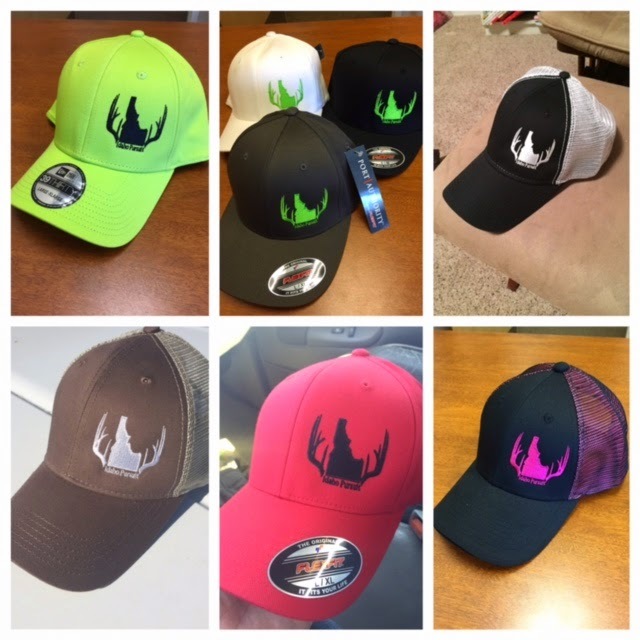 Be sure to click on our store tab to design your own Idaho Pursuit Hat and get it sent right to your doorstep!